“The only way past the pain is through it. ‘On a Wing and a Prayer’ is a phrase often used by the Defense forces especially the Air force. My late Father Col.NC Banerjee, an army officer used it often. Many references to this phrase can be found in song, prose, poetry & off course war! Yes war, this phrase originated during World War 02. It comes from a famous patriotic song composed by Harold Adamson with music by Jimmy McHugh during World War 02 in 1942. During various wars, this phrase was used by air crafts hit by enemy fire; those that barely made it back, against all odds. In a lay person’s term ‘if you do something on a wing and a prayer, you do it hoping that you will succeed, although you are not prepared enough for it’. Well, you might say, what has all this got to do with Friendship day & Ravens?! Everything! Everything! Dear Friends as you shall soon read! Well friends, sit back, curl up with your favorite cushion & read this amazing story. I can truly say, you won’t be disappointed. Friendship Day 2018 dawned clear and bright, it was a Sunday. People were in a week end mode & so was my family. Having had a scrumptious breakfast of stuffed parathas, we were relaxing. My daughter & her family live upstairs, my husband & I downstairs. My grandson Saharsh was sitting in the bay window upstairs watching his private Shaman world go by. The intercom was ringing too. “Ma just sees a crow has fallen off the tree & seems to be in pain.” All the panic buttons had been pushed and it was SOS situation at its best! I rushed out and looked over the wall. Yes, sure enough there was a young crow…. by human standards he/she would be a toddler! By this time a man had stopped his bike and was wondering what to do. 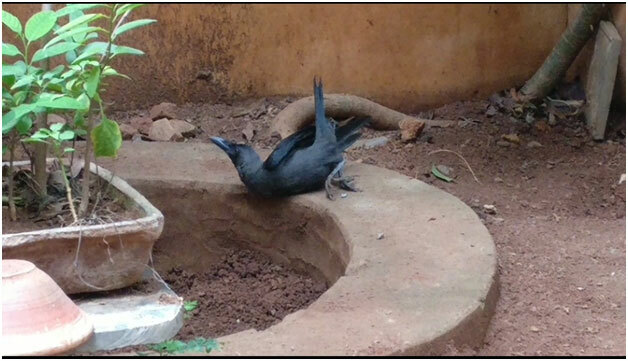 I requested him to pass the crow over the wall & we would take care. Feeling visibly relieved of his dilemma; he carefully picked up the little one and passed him to me. My heart was saying it is a He! So I will refer to the bird as He. My daughter and Grandchild had gathered around. By the way this beautiful black, full plumed crow with a long curved beak was a Raven. For those of us who are not familiar with this nomenclature, a Raven is from the same family as the crow with a few differences. Ravens have their habitat in the army areas, since there is not much human interference and plenty of trees. This little one seemed to be in a state of shock! No sound coming from him but mentally alert. As I checked him out I saw a deep gash in the chest area and blood flowing out, obviously in great pain. ‘Poor baby I thought, he is hurt so badly, yet not crying out, so brave’! Sadly one of his legs was hurt too, may be the impact of his fall. A few neighbors were watching and wondering what all thehullabaloo was about & for a crow?! Someone said “any how it will die”! I felt sad to hear this. His condition was indeed critical. My daughter suggested we take him to the vet. It was Sunday morning and we were not sure if the vet would be in his clinic. I wrapped Raven in my shawl & stroked his ajna chakra. It has been my experience; All creatures love and respond to this. So did Raven, he turned his neck and looked straight into my eyes. His open beak and unflinching stare was so beautiful. He seemed to be saying…..”Maybe, just maybe, I can trust you”! It was a beautiful…humbling and sublime moment. I took him inside my room. I showed him my sacred space and asked Source for healing. He was by now nestled into my arms covered with the shawl. My husband and I started out for the vet’s clinic. 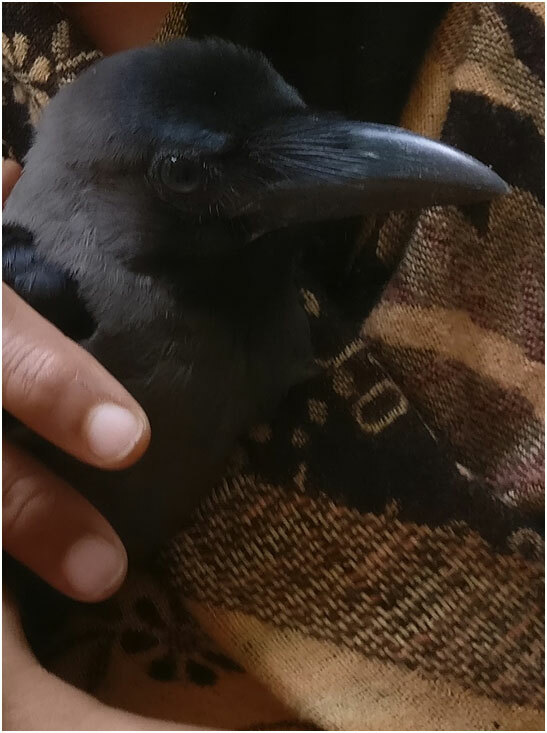 Little Raven was trying to free himself, not knowing what we were doing & where we were taking him. A few soothing words and he settled down. He held my finger tight with his claw; I guessed he was feeling safe now. As luck would have it, the vet was out of town! We were wondering what to do. The assistant sprayed some medicine. “This will take care of it” he said. “Please come tomorrow if he is still there, if he can fly then let him”. With these words we returned home. We tried to make him comfortable in our back yard. Our biggest challenge was keeping him in one place. He had a will of his own. He did not like to be covered or housed near a tree or flower pot. He was opening his beak wide. We fed him a few drops of water with a medicine dropper. He refused grain or rice. Trying to hop as far away from us as possible. Now was the time for the greatest test of endurance for any being. A time when the Only support is the striving of the Spirit & the Perseverance of one’s Heart. This Alone can help a being survive …..Live! The battle for survival had begun in great earnest & how?! It was over an hour and half. The little one seemed to be in great pain but not a caw out of him. What kind of Divine Grace does the Great Spirit….Father/Mother bless their with? Time and again I have observed this about our non-human relatives, the complete acceptance of their trauma & a very high pain threshold! Regular humans definitely do not have this gift. May be saints or highly evolved humans bear pain without noise or showing their trauma. My greatest respect for soldiers of all categories. They too have a high level of pain management threshold; they do not cry or shout. Coming back to our Raven’s journey. He tried to stand up, but his one good leg was unable to support his body. He stood up only to fall again. Initially we tried helping him, trying to set him straight. Support him against a flower pot. This only made him more agitated and scared. We decided not to do this. It was a difficult decision, seeing his agony & helplessness. I remembered Dr. Newton Kondaveti’s teachings, ‘we need to honor every Being’s desires for autonomy on their soul Journey’! Unknown or unseen by us his raven & crow fraternity had started gathering. Some on the trees, others circling in the air just above us. Suddenly a huge cacophony of raven& crow calls filled the atmosphere. Momentarily distracted we looked up. Crows and Ravens of every size had gathered in full force to support their comrade! This is what Little Raven was wanting for! He looked up & turned away. Something seemed to have awakened in his brave heart! As we had decided earlier, we withdrew into the kitchen to wait for the little one to show us the next step. What followed was extremely heart rending and painful to watch. Little Raven got up to fly; he flexed his wings and fell again. He was falling every few minutes. Yet he never gave up, never called it quits!!! He hopped on one leg& fell. Got hurt, fell down,and got up again. This carried on for more than an hour, nonstop. All the time he banged into wallsor trees. We felt that he had gone to another dimension through his pain. Many times he fell on his back with his legs up, struggling to gain balance and right himself. 20 to 25 times in that period, if not more. Can you imagine how he would have felt? The tremendous striving of his spirit. His great capacity to give each moment the same power as the earlier one. Never, ever letting up on the momentum. He reminded me of the spider from King Bruce’s legend! Friends, it was a long and torturous saga for Raven, knowing that all odds were stacked against him. For Raven it was unfamiliar (maybe) unsafe terrain. He had an injury on his brave chest, He had a wounded leg. The Only thing that was whole was his courage, his belief in himself & hisperseverance. He had the loyalty of his loving community, encouraging him, being with him in his most difficult hours.They called out from the tree branches overhead. They sent encouragement from the sky above. His community’s constant chanting of love messages reached Raven loud & clear! At times he went under the cement seat and hit himself against its walls. Many times falling on his back with his legs up& thenrighting himself again! At times when I could no longer see him hurting himself, I would pick him up. I would leave him in the open ground so he would be safer. He did not appreciate this at all! The constant loud raucous cawing of his buddies did not abate. Neither in tempo nor in loudness. No continuous chanting by humans could hold a candle to these love calls. Sometimes it felt his siblings and friends were saying “Buddy just fly, look up we are waiting for you”. Sure enough he would look up, beak open and gaze straight at his family & friends. We were watching from the window. Making sure no hungry cat or field mouse was lurking nearby. Friends, finally we saw an amazing sight! He was filling his chest with… breath …courage I knew not. He would expand his chest, open his wings and the shake his body vigorously. You can imagine how painful this was. He did this a few times. I could only send love energy to his brave, courageous expanded chest. I watched intently as this new activity started. Miracle of miracles he was now standing straight, supporting himself with a flower pot! I remembered my Shaman teacher saying an animal or bird does not store fear and trauma. After the ‘fight or flee’ process is over &if the being is still alive, it shakes itself and releases all negative energy. Unlike animals, humans store stagnant,fearful, negative energies in their luminous body. Well, our euphoria was short lived, as we saw a great change come over Raven. He was still standing leaning against the flower pot but his magnificent head was going down…..down…….down…. His beak was tucked into his feathers and he was standing very still. Imagining the worst we could only look on sadly as seconds turned into minutes. Somehow, I felt that I was intruding into very vulnerable and private moment of Raven’s& so stood aside. The chorus of his raven community was now louder and more vociferous. The overhead circling became very intense. Like a grand finale’, I thought sadly. Nothing was in our hands; we could only hold loving space for Raven on his journey. My domestic help a young girl told me “ Dadi, should you not once go and check? He does not seem fine”. Quite a few minutes had passed. I went out and stepped closer. Immediately Raven looked up & in a wink he rose in Flight! I was taken aback, what was thismiracle? Then I realized, he had been gaining strength in an altered state of consciousness. He was healing himself as he was receiving a very high vibration of chants from his family. To humans it would seem that he had died. However, he was journeying beyond the Middle world to the Upper World. My stepping near himbrought him back to the Middle World,he was healing fast! As I watched, he was standing strongly on his two legs. His mighty chest was expanded and his wings were now spread out, ready for flight. I quickly went inside. My Grandson, himself a Shaman child was in complete understanding & agreement of Raven being given space to manifest his miracle. We wanted Raven to have this beautiful moment for himself. We were speaking quietly in the kitchen. The elders of his community were now mostly on the tree overhead. We thought that maybe they would want to come down and be with him. We did not want to scare them or intrude into this magical healing time. He tried to take short, sharp flights a few times. Every trial brought him down. Now he seemed more confident and strong and continued trying. We were wondering how he would clear the six feet compound wall. We did not feel we should leave him outside, because there were stray dogs and cats on the prowl. We continued sitting inside,waiting. Suddenly we heard my help say “He is not here”! We ran out to search for him. He was nowhere in sight! There had been no distress call or caws. All seemed to be well. We searched all over but he had gone! Suddenly, we felt a huge change in the atmosphere. As we looked up the desperate, helpless caws had changed. The note was different as well as their whirling overhead. The Ravens on our tree had also left. As we continued looking we could see a flight formation taking place in the sky. The whole community was celebrating the return of their Dear One. Graceful swoops in and out of the circle. A dance of bliss in the sky, with chants of love and gratitude! Can you guess who was flying in the middle of the circle? Raven off course!! How did we know? 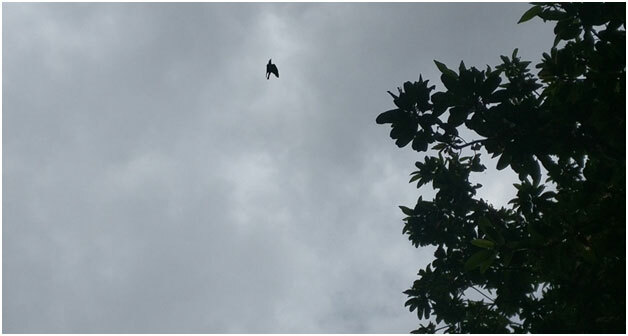 He was the only raven circling low directly overhead. All other birds were flying straight with both wingsaligned. Raven was dipping to a side and flying lower. Our wonder increased;as we could see that at times there was a slight dip and a pause midflight. 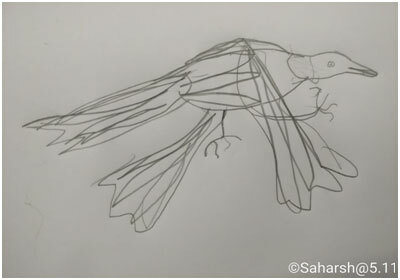 His wings and body were trying to align themselves! Hishealing Flight toLife was unfolding itself with great magnificence! We realized that the cawing was becoming softer, gradually it faded away. The raven community was returning to their homes in the nearby trees. Our Raven made his last few circles overhead, as if wishing us adieu’. Still bent to one side, he finally soared away into thesky! Yes Friends, Raven had finally made it on a Wing and a Prayer! He never cried out in pain, struggled in denial or just lay down and gave up! He Only went with the flow of his body wisdom & magnificence of his heart. He Healed himself! We were over whelmed, humbled and grateful for this lesson of love, camaraderie and support. Friends this is nothing but the triumph of the spirit! This great lesson of True Friendship on Friendship DaySunday, 5th August, 2018! What more could we ask for? We had received tremendous validation; nothing can ever impact the Soaring Spirit! It will go where it wills! That, of the Presence of the Great Spirit & of making authentic, brave choices to heal oneself. We as a family, once again experienced the Power ofour Animal/bird/insect Relatives, their wisdom, their unique medicine & the value of community. These are the basic principles of Shamanism. The Human’s role of being an Earth Keeper was once again reiterated to us by the Great Spirit. Being true& loving to our winged, furred, finned, two & four legged non-human friends/relatives is a lesson we all need to learn. We recorded certain bits of this saga. Actually, we had chosen not to do so initially. However, later we decided that the world should know of our brave Raven. There are some random video recordings which have been taken at the later stage of this saga. We shall share these with you on You Tube shortly. Shamanically, if a Raven enters your Life, it signals great change & transformation on many levels. Raven also knows the secrets of Death and beyond. It is revered as the sacred keeper of law; an oracle of divination and magic and a symbol of rebirth. Its message to us has the power to heal, by bringing aspects of ourselves to consciousness. We can learn much…… as we continue living in awareness, allowing our vision to see, our heart to feel and minds to accept these teachings. Friends, let not these soul lessons pass by. This is a true story you are reading in Eternal Life Times. Its message is powerful as it is simple. Try to develop a bond, make Friendship with every creature in Nature. Let us learn from our raven& crow friends, how to support each other as a family,a sangha, a community, a nation. Let us sendour peace and love to the world. Let us heal ourselves and hold space for others, as they heal themselves. Let us accord respect, as another Journeys to empowerment. Most of All never give up on Yourself or Another! Remember we are All Hollow Bamboos, allowing, holding, and facilitating the Breath of the Great Spirit.